I practiced several martial arts many years before. The Chinese martial arts I just have a little knowledge of them, so I coming to china to learn more culture things will help me to know about it more. My physical and mental endurance is to improve during the training in kunyu mountain. I learned how to make my motions more coordinated. And I learned a lot about Chinese culture and kungfu. First are my master sun, and a lot of good friends I made here and some of the more experienced students. And they help me a lot about improving myself. The level of academy is very high, the training is hard and challenge. After a few weeks you will get used to the academy quite well. Students are helping each other. We like a good family in the academy. And my master gave me a lot of help. I will never forget him in my whole life definitely. And translators are very helpful, every time you need it, they are just there. Daily life is cool; you have good scenery to see everyday. I really enjoy the time when I was staying in the academy. About the training I really like the mountain running, so I did it a lot of times. I really like the academy; I will definitely come back to the school, thank you very much! 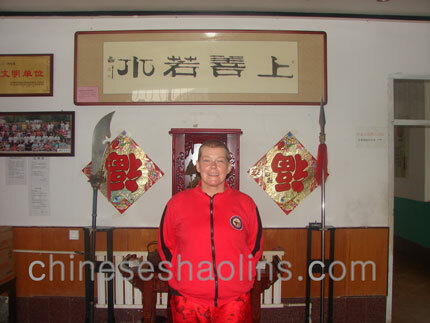 To find a connection between yoga and Chinese kungfu,I joined kunyu mountain kung fu academy. As soon as I’ve never punched or kicked before, this experience worth a lot to me to discover a part of myself. I’ve never met before. My master and my companions support me a lot.The training has been quite intense to me because I’m not used to this kind of training but my master has been helping a lot in changing my attitude , being very king and patient. The translators are very pleasant people, very kind and nice,they are doing a great job! The surroundings are all awesome, especially the mountains, the temple and the lake, do peaceful. Really enjoy it!